While you may love the ambiance and chargrilled taste the grill provides, oven-baked hamburger patties tend to be juicier and more tender than hamburgers cooked with other methods because the oven allows heat to be evenly distributed without drying it out. So if you're ready to ditch your grill in favor of the oven, here's what you must know about simple baked hamburgers in the oven so that they come out hot, juicy and delicious. Read more: What Is the Difference in Ground Round, Chuck or Hamburger? Preheat the oven to 400 degrees Fahrenheit. Gather all your ingredients (see list below) and wash your hands. The list above is only a beginner suggestion for cooking and seasoning your burger. Some of the other most popular additions to a burger, after salt and pepper, are chopped onion and garlic powder. Or you can get creative with things like chile powder, season salt, steak sauce or Worcestershire sauce. If you refrigerate your ground beef or patties for later use, keep them at 40 degrees Fahrenheit or below and use within two days. 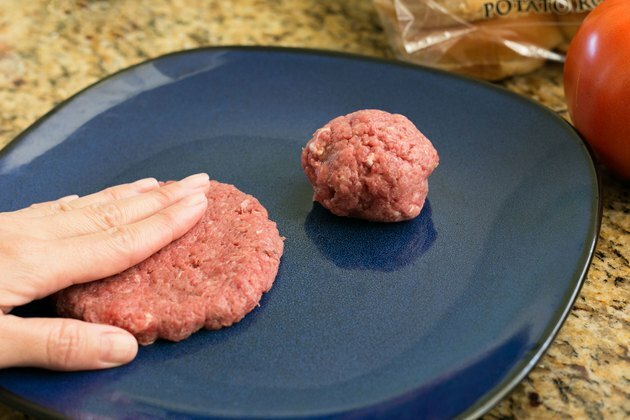 Never leave ground beef out at room temperature for more than two hours or you'll risk the development of microbes like salmonella and E. coli. 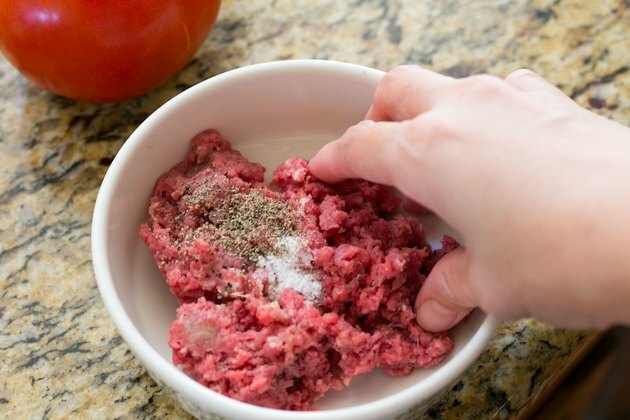 Combine 1/4 pound of ground beef , 1/2 teaspoon kosher salt and 1/2 teaspoon of ground black pepper. Mix together and form a ball, which should be about the size of a golf ball. Flatten the ball into a patty less than 1/2 an inch thick. Usually the thinner the patty, the less chance of overcooking and drying out the exterior. Try forming burgers so that they're thicker around the edges and thinner in the middle. This helps ensure even cooking, as the edges tend to cook more quickly than the middle. 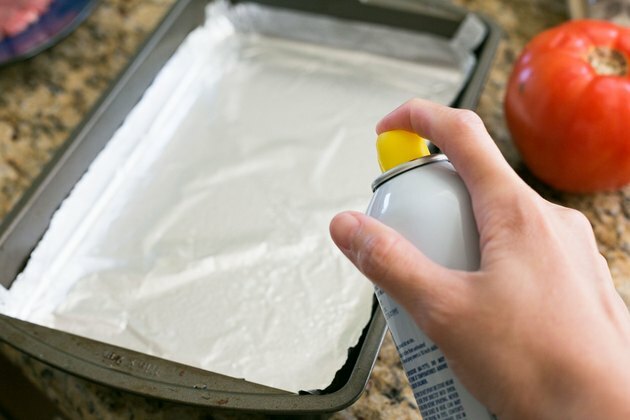 Spray a baking pan with nonstick cooking spray. Place the pan in the oven for five minutes before using. Heating the pan before the patty touches it will sear the patty quickly, locking in the juices. Then, place the patty on the baking pan, using cooking tongs. Put the hamburger in the oven. Bake the patty for five minutes. After five minutes, juices will start to appear on the surface of the patty. This is a good indication that the inside of the patty is being cooked. Pull the pan out of the oven with oven mitts. Flip the patty with cooking tongs. 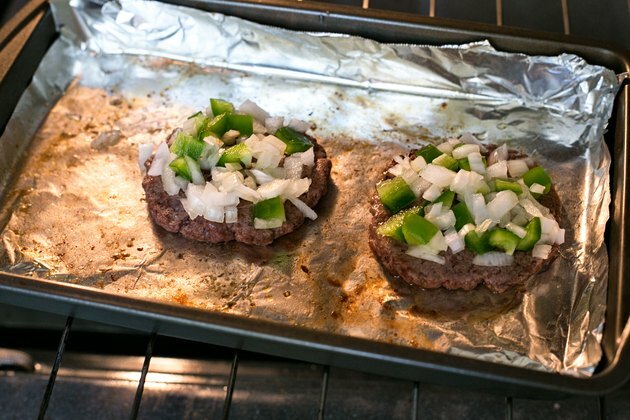 Add 1/4 cup each of diced green pepper and chopped onion to the surface of the patty. Put the hamburger back in the oven. Bake for an additional five to 12 minutes, until the interior of the patty is no longer pink or is cooked to your liking. 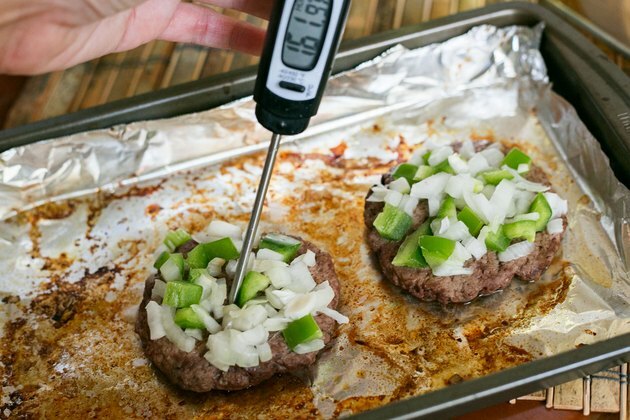 Stick a meat thermometer into the center of the patty. Make sure it reads a minimum internal temperature of 160 degrees Fahrenheit. The most common types of beef used for hamburgers are ground chuck, ground sirloin, ground round and ground beef with varying percentages of fat. All of these options can be purchased from your local grocery or health food store. While meat with less fat content will make for a healthier burger, the higher the fat content, the more heat the meat can withstand and the juicier your burger will be. Add cheese to the burger two minutes before it's done (when the thermometer reads 158 degrees Fahrenheit) and let it melt over the top. Mix in one to two tablespoons of mayonnaise (or full-fat Greek yogurt) before your make the patties and bake them. Grind up a strip or two of bacon to add into the mixture. Or you can use a tablespoon of bacon fat. Place a few ice cubes or a pat of butter in the middle of the patty before baking. Sear the burger for two to three minutes before putting the burgers in the oven. Try using ground turkey instead. Just make sure it's cooked to a minimum internal temperature of 165 degrees Fahrenheit. Sure, you can stick with your basic homemade hamburger — it's a classic for a reason! But if you're looking to expand your hamburger repertoire, here are a few more ideas you may want to try.